If you don't want to cook on Christmas Day, your options are limited since nearly every restaurant in Oklahoma City, Oklahoma, is closed for the holiday. There are a few eateries, like restaurants located in hotels, Chinese restaurants, and chain standards, that are open on Christmas. You will need to confirm before you go if you will need reservations and if special hours are in effect. The Flint is an upscale casual dining restaurant featuring contemporary American cuisine and entrees that highlight steak and seafood. Flint offers a kid-friendly menu, take-out and a hip vibe. It is located inside the Colcord Hotel downtown. The Bricktown Brewery, located at the Remington Park horse racing track, has a Christmas buffet. Foremost, Bricktown Brewery crafts beer, but they have not ignored food. They claim "twisted comfort food" as their motto. Some of those twisted offerings include green chile and chicken mac and cheese as well as avocado fries, which are fried, beer-battered avocado fingers served with a habanero mango aioli. You must be 18 or older to enter Remington Park. Denny's is a casual, national chain diner that is known for its breakfast food, but it also serves burgers, sandwiches, soups, and more. It is open 24 hours. Furr's is a longtime cafeteria chain that is now a buffet. There used to be a number of locations, however, the location in Moore, Oklahoma, is the only one left in Oklahoma. Some of the usual selections include chopped steak au jus with mushrooms, the baked cod almondine, salads, a variety of vegetables, and a variety of desserts. The Golden Phoenix bills itself as a Chinese barbecue and Vietnamese restaurant. 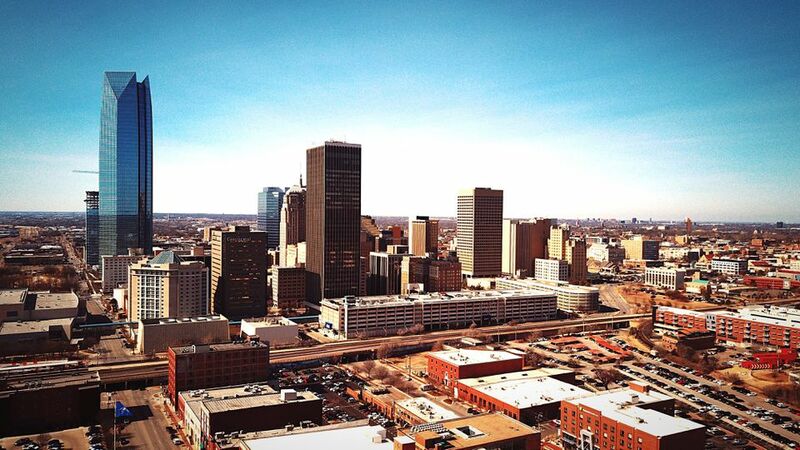 It is located in Oklahoma City's Asian District. On a cold Christmas Day, a steaming bowl of pho might be just the thing or a mountain of rice vermicelli topped with beef or shrimp. Gopuram Taste of India is one of the best spots for Indian cuisine in the metropolitan Oklahoma City region. The restaurant features northern and southern Indian cuisine like curries and dosas and has a vast list of vegetarian options. Gopuram has themed dining areas for a unique experience. The restaurant has two locations: it's original location on 23rd Street, and a second location, on Memorial Road. The Memorial Road location is expected to be closed on Christmas Day. At the Grand House Asian Bistro, the Chinese dishes are the favorites, but Grand House offers a huge variety of pan-Asian entrees and sides like sushi rolls, for example. You can also try the 76-dish dim sum on the weekends. This restaurant is located in the Oklahoma City's Asian district. The Iron Skillet at Petro Truck Stop is not exactly fine dining, but just off I-40, it is a casual, comfortable spot open Christmas Day. Iron Skillet has skillet and griddle specials, a buffet and salad bar, and a full menu that includes steak, pasta, fried chicken, seafood, and more. It is open 24 hours. IHOP, the national breakfast food chain, has multiple locations in Oklahoma City. The restaurant serves pancakes all day long, burgers, sandwiches, and entrees such as fried steak and a turkey dinner. It is open 24 hours. Mary Eddy's Kitchen and Lounge is located inside at 21c Museum Hotel, which was formerly the Ford Motor Company assembly plant. Mary Eddy's serves American cuisine in a nice setting, including brunch, a bar menu, and cocktails, too. Eclectic choices include the meat and cheese plate called the Toolbox, cast-iron skillet lasagna, and a S'mores Dutch baby for dessert. Nic's Place Diner and Lounge has two locations. The original location is home to perhaps the best burger in the metro area. The menu features the Jojo signature burger, which is topped with bacon, egg, and smoked gouda cheese. The Automobile Alley location is the place to go on Christmas Day. The historic, upscale district is festooned in Christmas lights and decorations that embrace the spirit of the holiday. Saltgrass Steakhouse, part of the Landry's family of chain restaurants, has two locations in Oklahoma City with modified hours on Christmas Day. The Park Avenue Grill is an upscale restaurant inside Oklahoma City's historic Skirvin Hotel that features New Zealand rack of lamb, brown butter diver scallops, and bourbon-brined pork chops. There are several preparations for steak and a mix of seafood entrees and appetizers to choose from.